Discover this wonderful picture book of Stone Art in full colour. This book is a must, with 28 sculptures to create accompanied by detailed step by step descriptions of how to make them. A bestseller. A 52 page book in full colour, full of beautiful realizations of animals for the novice and advanced, All explained step by step with corresponding step by step photos. A delight for the eye. A very informative DVD by Powertex Trainer Brigitte Grade, who takes you through a series of 4 workshops which introduce you the wide range of Powertex Products and how to use them. Brit Wellens introduces Powertex - a medium which provides endless possibilities for your creativity. This double DVD is a complete project based course that will enable the beginner to create wonderful pieces you may not have thought possible, and enable more advanced artists to widen their creative sphere with this fantastic and adaptable medium. Stone Art is an amazingly effective and adaptable part of the Powertex range which enables your to create wonderful effects such as rock, stone and concrete as well as combining with Powertex itself to create modelling clay. Brit Wellens shows you how with three very different projects that can follow and adapt to begin your own journey into Stone art! 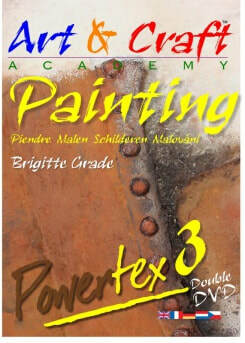 Join celebrated artist Brigitte Grade, the founder of Powertex as she provides a masterclass in Powertex exploring many different techniques using a wide range of materials and products to produce beautiful Powertex paintings which would grace any gallery or home. Brigitte gives a step by step explanation of the techniques which will both fascinate and inspire you.